The PriestMartyr Hyppolitus, and the Martyrs Censorinus, Sabinus, Chrysia the Virgin and 20 Other Martyrs suffered during the III Century. Saint Censorinus was an high-ranking dignitary during the reign of the Roman emperor Claudius II (268-270). Through a denunciation, he was arrested and locked up in prison for his faith in Christ. There by the Name of the Lord Jesus Christ he raised up a dead person, – as a result of which 20 soldiers, prison guards, were converted to Christ. They were beheaded together with Saint Censorinus. Then there was brought for interrogation the maiden Chrysia, who bravely confessed herself a Christian and was subjected to torture. After horrible torments she was drowned in the sea. Saint Sabinus they struck at with an heavy hammer, and then they hung the body on a tree and burnt it. In his torments he gave up his holy soul to the Lord. With Saint Chrysia suffered the Martyrs: Filiclus, Maximus, Herculinus, Venerius, Stiracinus, Minus, Commodus, Hermes, Maurus, Eusebius, Rusticus, Monagreus, Amandinus, Olympius, Cyprus, Theodore, Tribunus, Maximus the Presbyter, Archelaus the Deacon and Cyrenus the Bishop. Saint Hyppolitus, Bishop of Ostia, – a Roman sea-port at the mouth of the Tiber River, in learning about the suffering of the martyrs, despite his advanced years, showed up at the trial and denounced the torturers for their inhumanity, calling them blood-thirsty. The enraged judge gave the holy bishop over to torture. After long torments they tied him hand and foot and threw him into the sea. All these Roman martyrs suffered in the year 269. The relics of the PriestMartyr Hyppolitus were put at Rome into a church of the holy Martyrs Lawrence and Pope Damasus. 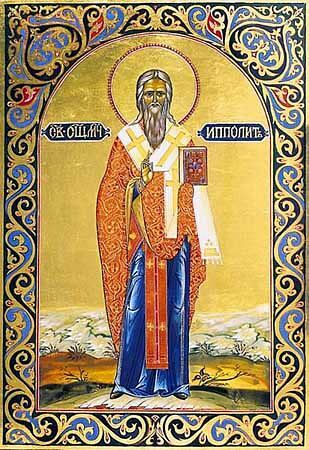 The holy PriestMartyr Hyppolitus was a student of Saint Ireneius, Bishop of Lugdunum (Lyons in France), and he likewise is reknown as a Christian theologian who had written many a composition against the heretics. Saint Hyppolitus compiled a Paschal Canon, a noted composition "About Christ", and a "Discourse concerning the Anti-Christ". Saint Hyppolitus wrote likewise many an exegesis of Holy Scripture, on the Biblical Books: Genesis, Exodus, Proverbs, Ecclesiastes, the Song of Songs, and on the Gospels of Matthew, Luke and John, and on the Prophets Isaiah, Ezekiel, Daniel, Zechariah, on the Psalms of David and on the Apocalyse. Part of his works are preserved only in fragments. In full are preserved his discourses, devoted to the Theophany and the Prophet Daniel. His discourses evidence his masterful style of ancient churchly preaching.